Recently, we introduced the complete genome sequence of Mycobacterium massiliense clinical isolates, Asan 50594 belonging to Type II genotype with rough colony morphology. Here, to address the issue of whether the rough colony morphotype of M. massiliense Type II genotype is genetically determined or not, we compared polymorphisms of the glycopeptidolipid (GPL) gene locus between M. massiliense Type II Asan 50594 and other rapidly growing mycobacteria (RGM) strains via analysis of genome databases. We found deletions of 10 genes (24.8 kb), in the GPL biosynthesis related gene cluster of Asan 50594 genome, but no deletions in those of other smooth RGMs. To check the presence of deletions of GPL biosynthesis related genes in Mycobacterium abscessus − complex strains, PCRs targeting 12 different GPL genes (10 genes deleted in Asan 50594 genome as well as 2 conserved genes) were applied into 76 clinical strains of the M. abscessus complex strains [54 strains (Type I: 33, and Type II: 21) of M. massiliense and 22 strains (rough morphoype: 11 and smooth morphotype: 11) of M. abscessus]. No strains of the Type II genotype produced PCR amplicons in a total of 10 deleted GPL genes, suggesting loss of GPL biosynthesis genes in the genome of M. massiliense type II genotype strains. Our data suggested that the rough colony morphotype of the M. massiliense Type II genotype may be acquired via deletion events at the GPL gene locus for evolutionary adaptation between the host and pathogen. Rapidly growing mycobacteria (RGM) infections in immunocompetent persons, as well as in persons with predisposing factors or who are immunosuppressed, are being reported more frequently [1, 2]. Particularly, of the RGMs, Mycobacterium abscessus − complex is commonly associated with wound infections and abscess formation and is the most frequent RGM causing chronic lung disease [3, 4]. Recent application of the combinatorial taxonomy including biochemical tests, anti-microbial susceptibility test, and multi-locus sequencing approach have suggested that the M. abscessus − complex is actually subdivided into three species: Mycobacterium abscessus subsp. abscessus, M abscessus subsp. massiliense, and M. abscessus subsp. bolletii; which exhibit clinically relevant differences in their antibiotic sensitivity profiles [5–7]. In South Korea, infection by members of the M. abscessus − complex is the most prevalent of RGM infections and second to the M. avium − complex of non-tuberculous mycobacteria (NTM) . NTM has long been known to have both rough and smooth colony phenotypes [9, 10]. This may be due mainly to the expression levels of glycopeptidolipids (GPLs). GPLs are produced by several NTMs, including RGMs, such as M. abscessus, M. chelonae and M. smegmatis, [11–13] and M. avium − complex (MAC) members, such as M. avium and M. intracellulare[14–16]. GPLs are responsible for smooth colonies and contribute to colonization of NTMs in the environment via biofilm formation; while, loss of GPLs is correlated with rough colonies and facilitates survival in macrophages . In the M. abscessus − complex strains, smooth phenotypes have occasionally spontaneously reverted to rough morphotypes after several passages on agar plates or via in vivo passage into mice . It was reported that there is a positive correlation between colony morphology and virulence, with rough variants generally being more virulent than smooth variants [17, 18]. This may be due primarily to the reduced expression of GPL, resulting in excessive secretion of TNF-α by the macrophage . Recently, targeted deletion of a gene, mmpL4b, in the M. abscessus is also reported to lead to loss of GPL and to show enhanced invasive abilities . A recent molecular epidemiology study based on partial hsp65 sequences (603 bp) indicated that M. massiliense (65/109 patients, 59.6%) of M. abscessus complex strains was more prevalent than M. abscessus (44/109 patients, 40.4%) in South Korea . Interestingly, infections in 30 of 65 Korean patients (46.2%) with M. massiliense, were found to be caused by a distinct Type II genotype not encountered in other areas . The most characteristic feature of this novel genotype is that all its strains showed the rough colony morphotype. This suggests that its rough colony phenotype may be due to an irreversible genetic factor rather than the reversible spontaneous reversion from smooth to rough morphotype previously introduced as a major mechanism for acquisition of the rough phenotype in M. abscessus − complex strains . The aim of this study was to prove our hypothesis that the rough colony phenotype of the new M. massiliense Type II genotype may be genetically determined. For this purpose, we first compared the GPL biosynthesis related gene loci of M. massiliense Asan 50594, belonging to the Type II genotype for which we recently provided a complete genome, with those of other RGMs . Second, to check whether GPL deletion is distinct for M. massiliense Type II genotype of M. abscessus − complex strains, PCR assays for the detection of GPL deletions were applied to the M. abscessus complex clinical strains, including a variety of groups. To check out the differences in the GPL expression patterns of M. massiliense Type I and Type II strains, purified GPLs were examined and analyzed using matrix assisted laser desorption ionization-time of flight mass spectrometry (MALDI-TOF MS). Pronounced differences in the MALDI-TOF MS profiles were found between the GPLs of the two genotypes. 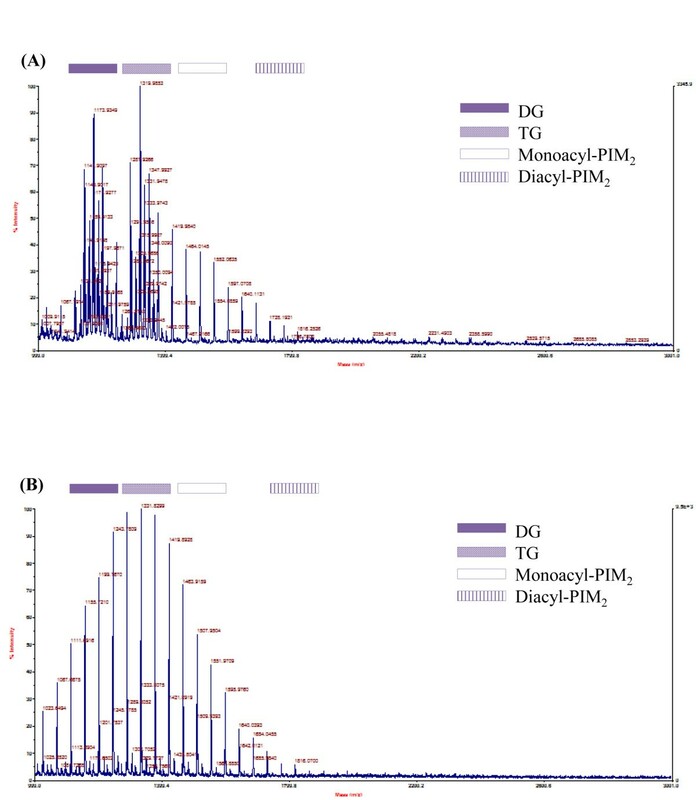 In the case of M. massiliense Type I strain Asan 51843, the MALDI-TOF MS profiles showed two distinct clusters of peaks ranging from m/z 1101 to m/z 1245 and from m/z 1287 to m/z 1419, corresponding to diglycosylated GPL and triglycosylated GPL, respectively (Figure 1A). All four of the other Type I strains also showed MALDI-TOF mass spectrometry profiles similar to Strain 51843 (Additional file 1). However, the MALDI-TOF MS profiles of GPLs from M. massiliense Type II Asan 50594, were showed unusual, with significantly lower intensity of the peaks corresponding to the putative GPLs, compared to the profiles of the Type I strains (Figure 1B). Also, all four of the other Type II strains showed MALDI-TOF MS profiles similar to Strain 50594 (Additional file 1). This means that there was loss of GPLs in the cell wall components of the M. massiliense Type II strains. MALDI-TOF MS analysis of extracted GPLs from: (A) M. massiliense Type I Asan 51843, (B) M. massiliense Type II Asan 50594. Abbreviations: DG, diglycosylated GPLs; TG, triglycosylated GPLs; PIM2, phosphatidylinositol dimannoside. To check out whether the GPL loss in M. massiliense Type II is genetically determined or not, we performed comparative genomic analysis of 29 GPL biosynthesis related genes (one larger cluster of ~40 kbp covering 19 genes, one smaller cluster of ~19 kbp covering 6 genes and four distributed genes in M. abscessus) from M. massiliense Type II Asan 50594 (GenBank Accession No., CP004374) and four other RGMs, [M. abscessus CIP 104536T (GenBank Accession No., NC_010397), M. massiliense CCUG 48898T (GenBank Accession No., AKVF00000000), M. chelonae CIP 104535T (GenBank Accession No., AM231610-AM231615), and M. smegmatis str MC2 155 (GenBank Accession No., AY439015)] [13, 21, 22]. When compared with M. abscessus CIP 104536T and M. massiliense CCUG 48898T, or M. massiliense Type II Asan 50594, the percentage of identity of amino acids between 2 strains ranges between 86 and 100% (Table 1). Similar to the M. abscessus CIP 104536T, M. massiliense CCUG 48898T or M. massiliense Type II Asan 50594 have GPL biosynthesis related genes which were divided into two clusters. In the genome of M. massiliense Type II Asan 50594, one cluster of ~11 kbp covering 8 genes (from MASS_4108 to MASS_4116, counterparts for gap to mmpS4 in M. abscessus), one cluster of ~19 kbp covering 6 genes (from MASS_0918 to MASS_0923, counterparts for gap-like to pks in M. abscessus) and five distributed genes (MASS_4474, 4488, 4493, 4660 and 4722, counterparts for fadE5, sap, ecf, Rv0926 and mbtH in M. abscessus, respectively) were found among the GPL-biosynthesis related genes. Interestingly, compared to other RGMs, there are no counterparts of 10 GPL biosynthesis related genes in the genome of M. massiliense Type II Asan 50594 (Table 1, Figure 2). All the deleted genes were found in the region corresponding to the first larger GPL cluster in M. abscessus CIP 104536T or M. massiliense CCUG 48898T. Genes atf1 and atf2, which are responsible for acetylation ; gtf1 and gtf2, which are involved in the glycosylation of the lipopeptide core [24, 25]; rmt2, rmt3, and rmt4, which are involved in the O-methylation of the various hydroxyl groups of the rhamnosyl unit; fmt, which is also involved in the O-methylation of the lipid moiety [26–28]; and mps1 and mps2, which are responsible for assembling the tripeptide-aminoalcohol moiety , were deleted from the GPL locus of M. massiliense Type II Asan 50594 (Table 1, Figure 2 and Figure 3). a Accession number: NC_010397 (13). b Accession number: AKVF00000000 (24). c Accession number: CP004374 (20). d Accession number: AM231610-AM231615 (13). e Accession number: AY439015 (13). Organization of GPL biosynthesis related genes. Color code: Light blue – mmpL family; black – unknown; purple – sugar biosynthesis, activation, transfer and modifications; red – lipid biosynthesis, activation, transfer and modifications; green – pseudopeptide biosynthesis; yellow – required for GPL transport to the surface; grey – regulation. Schematic representation of the structure of the GPLs from M. smegmatis (13). The genes involved in GPL synthesis are indicated in brackets and the genes deleted in M. massiliense Type II Asan 50594, are indicated with strikethrough line. Abbreviations: OAc, acetyl; OMe, methyl; dTal, 6-deoxytalose; D-Rha, rhamnose of the D series. Considering that GPLs are related to formation of smooth colonies, these deletions represent the phenotypic characteristics of M. massiliense Type II, which only occurred in rough colonies . To check the presence of the GPL biosynthesis related genes from M. massiliense and M. abscessus clinical isolates, DNAs from 76 M. abscessus related strains were amplified by PCRs using 12 primer sets (Additional file 2), which targets 10 deleted genes in Asan 50594 genome: atf1, atf2, fmt, gtf1, gtf2, rmt2, rmt3, rmt4, mps1, and mps2 and 2 conserved genes as PCR positive controls: gap and rmlB genes, which were found in the genome of all M. abscessus related strains including Asan 50594. Of 76 strains, 21 strains of M. massiliense Type II were not amplified by PCRs targeting 10 deleted genes in Asan 50594 genome, but amplified by PCRs targeting 2 conserved genes, suggesting the loss of corresponding GPL genes in all 21 M. massiliense Type II strains. But, all the remaining 55 strains were positively amplified by PCRs targeting 10 deleted genes as well as 2 conserved genes, suggesting the presence of targeted GPL biosynthesis genes in their genome. It should be noted that all the 23 strains with rough colony morphotype (12 M. massiliense Type I and 11 M. abscessus strains) except for M. massiliense Type II produced positive amplifications in PCRs targeting 10 deleted genes, suggesting there may be the disparity between M. massiliense Type II and other related strains in mechanism leading to rough colony phenotype (Figure 4, Table 2 and Additional file 3). Confirmation of deleted GPL biosynthesis related genes by PCR among clinically isolated M. massiliense and M. abscessus. M, 100 bp DNA ladder; Lane 1, M. massiliense Type I Asan 51843; Lane 2, M. massiliense Type I Asan 50375; Lane 3, M. massiliense Type I Asan 15; Lane 4, M. massiliense Type II Asan 50594; Lane 5, M. massiliense Type II Asan 52012; Lane 6, M. massiliense Type II Asan 1; Lane 7, M. massiliense Type I (rough) Asan 22; Lane 8, M. massiliense Type I (rough) Asan 23; Lane 9, M. massiliense Type I (rough) Asan 54790; Lane 10, M. abscessus (smooth) Asan 57214; Lane 11, M. abscessus (smooth) Asan 57388; Lane 12, M. abscessus (smooth) Asan 58417; Lane 13, M. abscessus (rough) Asan 55088; Lane 14, M. abscessus (rough) Asan 56232; Lane 15, M. abscessus (rough) Asan 56544; N, negative control. Infection by M. massiliense strains of RGMs has gained importance together with its increasing prevalence over the world [30–35]. In particular, a recent study based on whole genome sequencing revealed the first evidence of human to human transmission in NTM infection, by proving its transmission between cystic fibrosis patients; suggesting unusually high infectivity of humans by M. massiliense strains . In South Korea, a distinct epidemiologic trend was reported , of higher prevalence of M. massiliense strains (of the M. abscessus − complex); part of which may be attributed to the presence of the M. massiliense Type II genotype found only in Korean patients . The combination of our genomic and molecular epidemiologic data in this study proved that all the strains belonging to a novel M. massiliense Type II genotype, showed loss of genes related to GPL biosynthesis (10 of 29 consecutive genes in M. abscessus) (Table 1, Figure 2 and Figure 3), resulting in irreversible rough phenotypes. Our PCR data targeting 12 GPL biosynthesis genes suggested that there may be the disparity between 2 groups, M. massiliense Type II and other M. abscessus related strains in evoking rough colony phenotypes. Unlike the former acquiring rough phenotype via a genetically determined mechanism, it cannot be excluded that GPL loss of the latter may be mediated by a not-yet determined non-genetic mechanism leading to the transient GPL loss, as reported in other papers . But, the exact mechanism related to rough colony phenotype of the latter has to be elucidated in the future. To our knowledge, this is the first report regarding this genetic defect of GPL biosynthesis in NTMs. Unlike for the M. tuberculosis − complex strains capable of transmission from human to human, in general, NTMs can infect humans only from environmental sources, although infection between cystic fibrosis patients by M. abscessus − complex strains has recently been reported . Therefore, GPL is generally necessary for NTM survival in the natural environment (soils and water), and for human infection from environmental sources [17, 23]. Particularly, in M. abscessus strains, the change of colony morphology from smooth to rough type, which provides an advantage for survival within a host macrophage, has so far been reported to happen spontaneously after host infection by reduction of GPL expression; not by irreversible genetic loss [17, 36]. Given that M. tuberculosis − complex strains are strict pathogens that do not harbor gene loci related to GPL biosynthesis within their genomes, it is inferred that strains belonging to the M. massiliense Type II genotype may be more adapted to human infection than other members of M. abscessus complex. After sub-cultures of more than 10 generations on 7H9 broth or 7H10 agar plates, the reversion of rough to smooth type was not found in any Type II strains (data not shown). This further supports our hypothesis that the rough morphotype of Type II, like M. tuberculosis, may be an innate (genetic) trait derived from a smooth strain by evolutionary events, rather than a transient trait acquired during an in vivo infection. Collectively considering our data only for the selective separation of the M. massiliense Type II genotype, we recommended combinatorial PCRs targeting both GPL deletion and conserved genes (e.g., hsp65), because they can be used for simple separation of the genotypes without additional procedures such as sequencing or PCR restriction analysis. In conclusion, our data showed that the M. massiliense Type II genotype showed gene loss related to GPL biosynthesis within its genome, resulting in a rough colony phenotype. To our knowledge, this is the first report of an NTM with a rough colony phenotype genetically determined by GPL gene loss. All clinically isolated M. abscessus and M. massiliense used in this study were cultured in 7H9 broth supplemented with 10% ADC at 37°C for 3 days. For MALDI-TOF analysis, five M. massiliense Type I (50375, 51843, 52352, Asan 7 and Asan 15) and five M. massiliense Type II (50594, 51048, 52012, Asan 1 and Asan 19) strains were used. For the PCR confirmation of GPL biosynthesis-related genes, a total of 76 strains [M. massiliense Type I (21 strains), M. massiliense Type II (21 strains), rough M. massiliense Type I (12 strains), smooth M. abscessus (11 strains) and rough M. abscessus (11 strains)] were used and listed in Table 3 and Additional file 4. All clinical strains were selected from among the 109 strains used in the previous report . Separation of all M. abscessus − complex strains into genotypes or subspecies was performed by 603-bp hsp65 based sequence analysis as described previously . Abbreviations: Type I, M. massiliense Type I strain; Type II, M. massiliense Type II strain; Type I (R), M. massiliense Type I (rough colony morphology) strain. 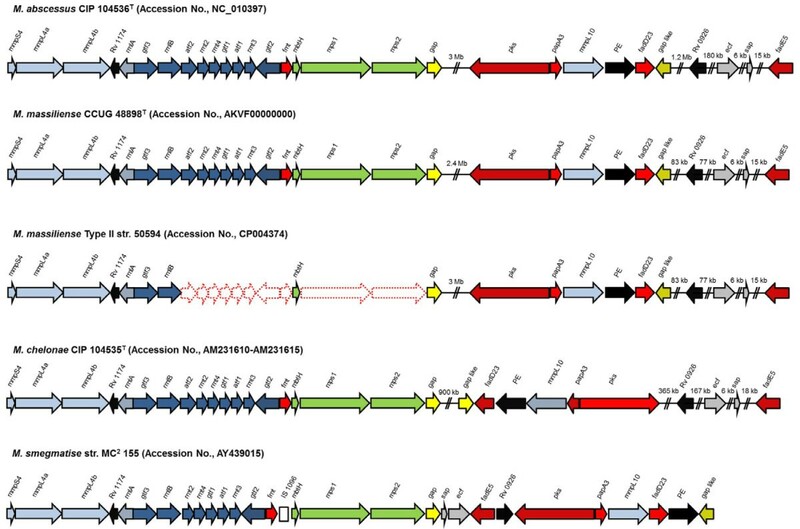 To characterize the GPL profiles of the M. massiliense Type I and Type II strains, five Type I (50375, 51843, 52352, Asan 7 and Asan 15) or Type II (50594, 51048, 52012, Asan 1 and Asan 19) strains were harvested at exponential phases of growth, and separated from the culture media by centrifugation at 4,000 rpm for 15 min. Each bacterial pellet was suspended in CHCl3/CH3OH [2:1, v/v; 10 ml/g (wet weight of bacterial pellet)]; sonicated two times (pulse for 1 min and stop for 10 sec, total 15 min), and incubated at 4°C overnight. After that, the suspensions were centrifuged to remove insoluble material and subjected to biphasic partitioning in CHCl3/CH3OH/H2O (4:2:1, v/v). Total lipid extracts were treated with an equal volume of NaOH (0.2 M in CH3OH, 45 min at 37°C), neutralized with glacial acetic acid, and dried in air. Finally, GPLs were extracted in CH3Cl/CH3OH (2:1, v/v) [17, 38, 39]. MALDI-TOF mass spectrometry was performed on the extracted GPLs with a Voyager DE-STR MALDI-TOF instrument (Perseptive Biosystems) equipped with a pulse nitrogen laser emitting at 337 nm as previously described [24, 40]. The comparative genomic analysis was performed via comparison of pairwise alignments between the amino acid sequences of the GPL biosynthesis related 29 genes of M. abscessus CIP 104536T (GenBank Accession No., NC_010397), M. massiliense CCUG 48898T (GenBank Accession No., AKVF00000000), M. massiliense Type II Asan 50594 (GenBank Accession No., CP004374), M. chelonae CIP 104535T (GenBank Accession No., AM231610-AM231615) and M. smegmatis str. MC2 155 (GenBank Accession No., AY439015) [13, 21, 22]. The comparative genomic analysis was performed by pairwise alignments between the amino acid sequences of the GPL biosynthesis related genes of M. massiliense Type II Asan 50594 and the other RGMs mentioned above. Comparisons were performed using the MegAlign  and BLASTP program (http://blast.ncbi.nlm.nih.gov/Blast.cgi), and percentage of identities for genes were calculated. Total DNA was extracted from colonies using the bead beater-phenol extraction method, and then used as templates for PCR. To check the presence of GPL biosynthesis related genes in M. abscessus complex strains, we used purified DNAs from 76 clinical isolates, which included 33 M. massiliense Type I (21 strains: smooth, 12 strains:rough), 21 M. massiliense Type II (rough), and 22 M. abscessus (11 strains: smooth, 11 strains: rough) (Additional file 4). Using the M. abscessus CIP 104536T (GenBank Accession No., NC_010397) and M. massilense CCUG 49989T (GenBank Accession No., AKVF00000000) genome sequences [13, 22], 12 primer sets were designed (Additional file 2). To amplify 12 independent genes from the DNA of M. massiliense and M. abscessus clinical isolates, the template DNA (50 ng) and 20 pmol of each primer were added into a PCR mixture tube (AccuPower PCR PreMix; Bioneer, Daejeon, South Korea) containing one unit of Taq DNA polymerase, 250 μM of deoxynucleotide triphosphate, 10 mM Tris–HCl (pH 8.3), 10 mM KCl, 1.5 mM MgCl2, and gel loading dye. The final volume was adjusted to 20 μl with distilled water, and the reaction mixture was then amplified as follows: denaturation at 95°C (5 min); 30 cycles of denaturation at 95°C (30 sec), annealing at 62°C (30 sec), elongation at 72°C (45 sec), and final elongation at 72°C (5 min) – using a model 9700 Thermocycler (Perkin-Elmer Cetus). Also, as a negative control, distilled water was amplified using all the primer sets. 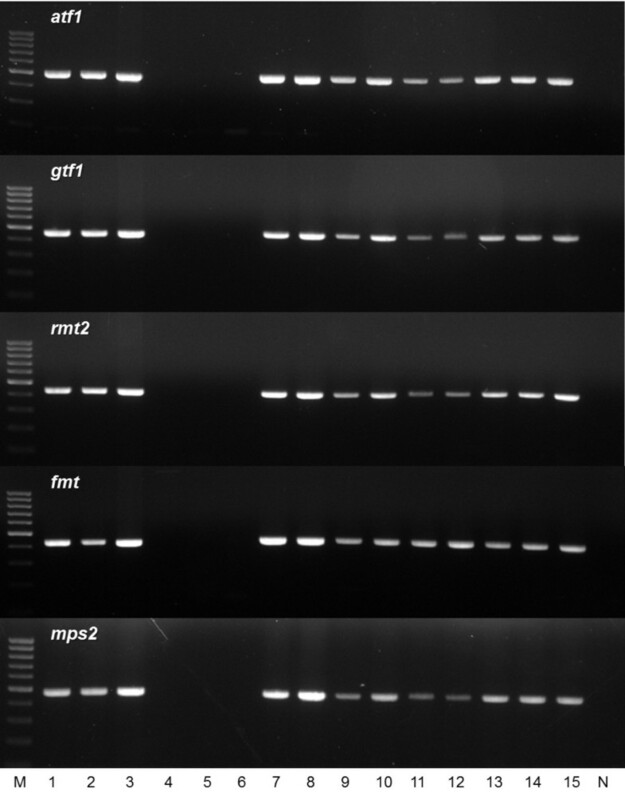 After amplification, the mixtures were electrophoresed in 1.5% agarose gel with GeneRuler™ 100 bp DNA ladder marker (Thermo Scientific, Pittsburgh, PA, United States). The data sets supporting the results of this article are included within the article and its additional files (Additional files 1, 2, 3 and 4). Rhamnose of the D series. This work was supported by National Research Foundation of Korea (NRF) grant number of NRF-2012R1A1A2041449, Republic of Korea. The authors declare non-financial competing interests. BJK (Byoung-Jun Kim) carried out MALDI-TOF and comparative genome analysis and interpretation the data. BRK and SYL carried out PCR and purification GPLs. YHK helped to draft the manuscript. BJK (Bum-Joon Kim) conceived of the study, participated in study design and drafted the manuscript. All authors read and approved the final manuscript.